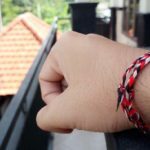 What Is The Meaning Of Thread Bracelet For Hindus? 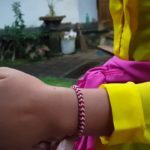 If you see if most of Hindu people use a thread bracelet that comes from 3 colors of thread, then one question that will appear is “What is that?” For Hindu people, and in Bali, it’s called by “Gelang Tridatu” or Tridatu Bracelet. Tri Datu etymologically comes from the word “tri” which means three, and “datu” means king, so Tri Datu means thereof kings. 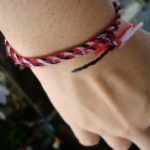 The colors of Tridatu Bracelet are red, black, and white. Tridatu Bracelet is not a magic talisman. It is a symbol of The God in Tri Murti manifestation. The Tri Murti manifestation of The God is; Brahma, Vishnu, and Shiva. These Lords have their own color that is symbolic of them. In Hinduism, Tri Murti is the three forces of Ida Sang Hyang Widhi Wasa in creating, preserving, and restore to the origin of nature and its contents. In the Tridatu Bracelet, there are 3 colors of Tri Murti. Red is the symbol of Brahma Lord, and then Black is the symbol of Vishnu Lord, and White is the symbol of Shiva Lord. The thrice of Tridatu, which are as the symbol of Tri Murti, Tri Pramana, and Tri Kaya Parisudha as self-actualization, is expected to begin to realize the Hindu identity. These are as a way to self-introspection. With this self-introspection are expected Hindu people can live in accordance with the concept of Hinduism that one with the other has attached. The Hindu people will realize that this is part of life, and life is only a small part of the universe. By remembering The God, living by the way of The God is the longing of people to return to The God.